Sparkler gets its name from the colour, Bright red and the pure white tip that seems to sparkle. Sparkler is adapted to cool season production. 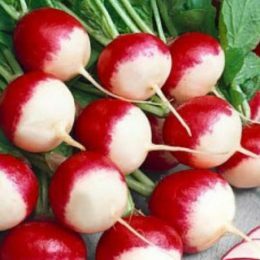 Icicle is a blunt cylindrical, pure white radish with a mild flavour. Icicle is adapted to a wide range of soils and geographical regions. Easter Egg Blend II offers a range of six delightful colours that consts of shades of red, white, pink and purple.